Is it too cliche and overdone to say that these chocolate chip banana bread scones are the best scones that I’ve ever had? I’m quite serious. If I hadn’t teased everyone with the photo before I tasted them I would have honestly tucked these away for my next cookbook. Indeed, these might make it into any future cookbook despite posting the recipe now, because they are infinitely cookbook worthy. 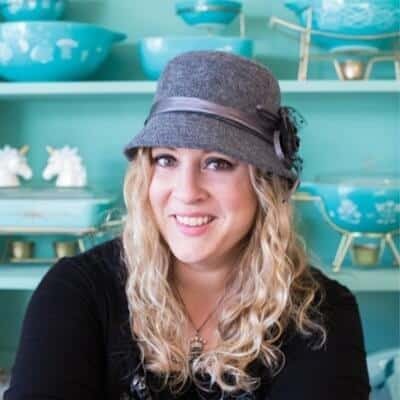 January is always a month of reflection for me when it comes to The Kitchen Magpie. I like to sit back and take a look at the journey that I’ve gone through over the last 365 days and think about the direction that I want to take in the new year. This January however has seen me so busy that I don’t know which end is up. I’d like to say that it’s a natural consequence of taking a five-week vacation, but in all honesty I think that we all know that I constantly work while on my vacations with the inevitable result of all these working vacations being my affinity for cruises. I love cruises because they disconnect me from the internet (no way I’d ever pay those prices!) and I actually take a real vacation. Usually. This past cruise over Christmas I finally had to cave and pay for the internet – at least it was a business expense – and post a sponsored recipe here for everyone to enjoy. Working for yourself can be the best and worst thing in the world. I’ve learned it well over the past few years and even more so when Mike joined me and started working from home himself. It’s amazing and hard, freeing and confining in the same breath and wonderfully terrifying all around. I’ve often told Mike that no one sees us working until 11 pm at night because we have some last-minute work that popped up simply because we don’t Instagram or Facebook those types of things. And perhaps we should, if only to add some more balance, it may all look like fun and games but there is so very much work between. But that’s boooooring, and boring I am not. Even today, a Saturday night, is the first time I feel like I’ve really had a chance to sit down and talk to you all in weeks, maybe even months. To just simply sit and share a recipe, with no other purpose than to share something delicious. Christmas sees me trying to help you all out as much as possible with recipes and ideas, pulling them from my archives and sharing them so that you have the best possible choices when it comes down to the big holiday. You’re busy, I’m busy and it’s harder to connect in that mad holiday rush. However I’m here and I still know that you are out there, all the time. You’ve loved me even though I’ve been scatterbrained and inconsistent thanks to my cookbook work. You’ve all been so excited for it and I hope that I don’t let you all down, in some weird way. It’s turning out so beautiful and I consider it an honour and a privilege to get it into your hands next fall. Hang in there guys, my book will be here before you know it and I’ll get to come around to as many places as I can fit in and meet as many of you as I can. I’m taken another hard look here at the website and you’ll see a few changes. There are some design tidbits that accidentally were left off when I changed the front page. I’m most likely going to keep the slider off the front page and change things around a bit. There are some new things coming this year, very soon, that I am really excited about. It’s going to be fun for me and that’s the most important thing of all. With the whole website spring clean came a freezer clean as well. That’s where the idea for these chocolate chip banana bread scones came from. I might have a couple of banana recipes coming up in the next two weeks thanks to the Great Freezer Clean of 2016. 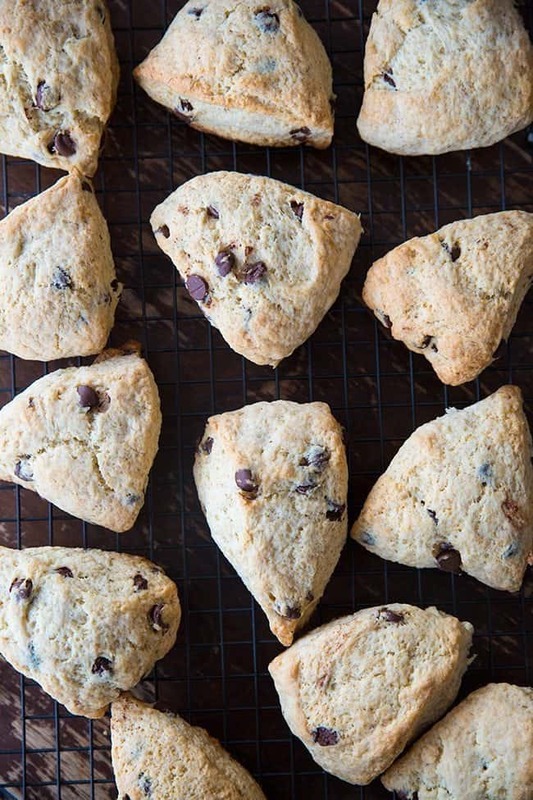 If you love banana bread, you will love these scones. I don’t know why I hadn’t thought of these before and I’m rather sad now that I haven’t been eating them for years. They retain the scone texture but taste like chocolate chip banana bread. Consider my mind officially blown when the recipe actually turned out like this. I expected a banana bread texture and was thrilled that they remain a true scone. So here’s to 2016 and getting back in the fray! Happy baking! 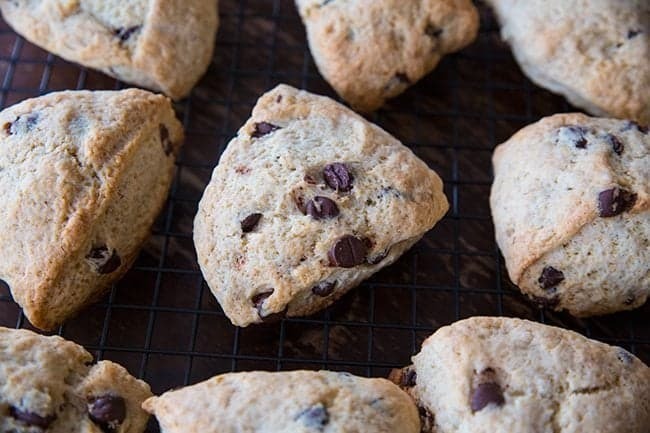 Let me know if you try these fabulous chocolate chip banana bread scones! Don’t forget to PIN THIS RECIPE to your BAKING board and remember to FOLLOW ME ON PINTEREST! 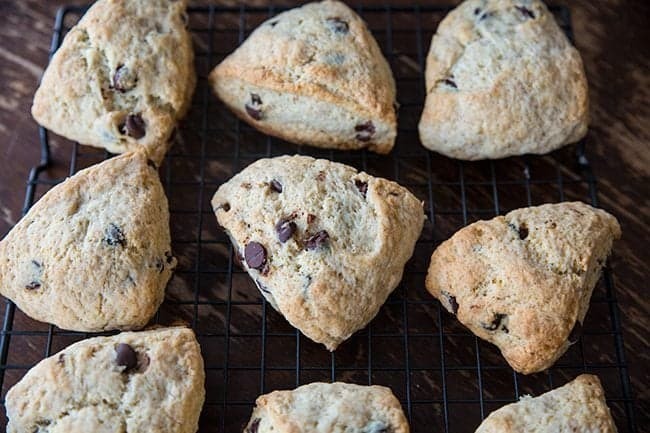 Chocolate chip banana bread scones that tastes exactly like banana bread yet still have the texture of a scone. These are literally the best scones I've ever made. 1 cup of semi-sweet or dark chocolate chips. Kick the tires & light the fires to 350 degrees. Combine the sour cream and baking soda in a small dish; set aside. In the bowl of a stand mixer fitted with a paddle attachment, place the flour, white sugar, baking powder and salt. Put the cold butter cubes in and start the mixer on low. Mix the flour and butter until the butter is cut in and breaks down to bits the size of small peas. Mix together the egg, banana, vanilla and the sour cream mixture. Spoon into the mixing bowl then mix on low speed until just moistened. Add in the chocolate chips, stir until combined throughout the mixture thoroughly. Divide the dough into three equal parts and form into circles. Cut each circle into 6 equal sized pieces. Bake on a parchment lined baking sheet for 17-20 minutes until the scones are well browned on the bottoms and the tops. Remove and cool slightly on a baking rack. Serve warm or cold plain or with butter. can’t go wrong with banana and a chocolate mix. Oh, that’s a good lunch! What is the oven temperature for these scones?